The return to public assemblies and direct democratic methods in the wave of the global "squares movements" since 2011 has rejuvenated interest in forms of council organisation and action. The European council movements, which developed in the immediate post-First World War era, were the most impressive of a number of attempts to develop workers’ councils throughout the twentieth century. However, in spite of the recent challenges to liberal democracy, the question of council democracy has so far been neglected within democratic theory. This book seeks to interrogate contemporary democratic institutions from the perspective of the resources that can be drawn from a revival and re-evaluation of the forgotten ideal of council democracy. 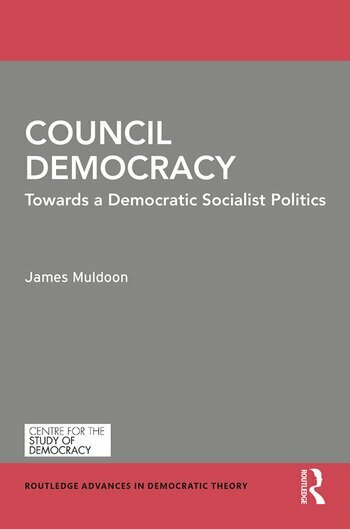 This collection brings together democratic theorists, socialists and labour historians on the question of the relevance of council democracy for contemporary democratic practices. Historical reflection on the councils opens our political imagination to an expanded scope of the possibilities for political transformation by drawing from debates and events at an important historical juncture before the dominance of current forms of liberal democracy. It offers a critical perspective on the limits of current democratic regimes for enabling widespread political participation and holding elites accountable. This timely read provides students and scholars with innovative analyses of the councils on the 100th anniversary of their development. It offers new analytic frameworks for conceptualising the relationship between politics and the economy and contributes to emerging debates within political theory on workplace, economic and council democracy. James Muldoon is a lecturer in political science at the University of Exeter. His main research interests are in democratic theory, socialism and the history of political thought. His work has appeared in History of Political Thought, Political Studies, Theory, Culture & Society, Constellations and Critical Horizons.